Two champions emerged with one whole race day left in the fifth and final round of the MRF MMSC FMSCI Indian National Racing Championship 2017 at the Madras Motor Race Track in Chennai. Championship leader Anindith Reddy took home the MRF 1600 class title despite not finishing the race, while young Arya Singh finished the day with the National and Rookie titles in the Formula LGB 1300 class. Battles for the other titles have intensified in the remaining classes and the last day of racing promises to be a treat for Indian motorsport fans. Sandeep Kumar won the F1600 race on Saturday in Round 5 of the MRF MMSC FMSCI Indian National Racing Championship 2017. 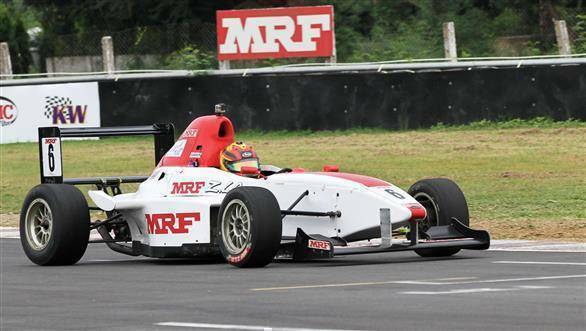 MRF 1600 class championship leader Anindith clinched the title on Saturday despite a non-finish. A collision during the race, that cost him the rear wing of his car, still left him with a 32-point lead over competitor Sandeep Kumar, who won the race on Saturday. With two races to be run on Sunday, and maximum of 25 points at stake, Anindith's lead cannot be surpassed. The championship fetches Anindith Reddy a ticket to the Mazda Road to India shootout in the USA later this year. Arya had a great outing on Saturday finishing first and second, respectively, in his two races of the Formula LGB 1300 class during the day. This earns him the National as well as Rookie titles in the class. The schoolboy from Kolkata was elated to win both titles, but acknowledged that he did not have the pace for outright wins in both the races this weekend. Arya Singh won the Rookie and National championships in the Formula LGB 1300 class. Meanwhile, there was high drama in the Indian Touring Cars class race as championship leader Deepak Paul Chinappa of Race Concepts began the race from pole position and led for six laps, looking set for a win. However, a brake failure took him down to seventh position in the last two laps and across the finish line. It was defending champion Arjun Narendran who gained and won the race, with Red Rooster Performance team-mate Ashish Ramaswamy in second. Narendran now has 169 points, while Deepak sits at 157. Having dominated the the Free Practice as well as Qualifying sessions on Friday, Saurav Bandyopadhyay recorded his second win of the MMSC Volkswagen Ameo Cup 2017, with guest racer from China Anning Sun finishing second, and Sandeep Kumar third. Championship leader Karminder Singh still sits atop the leaderboard, with a 92-point lead. Indian Touring Cars (8 laps): 1. Arjun Narendran (Red Rooster Performance) (15 mins, 24.752 sec); 2. Ashish Ramaswamy (Red Rooster Performance) (15:25.263); 3. D Vidya Prakash (Prime Racing) (15:38.322). Formula LGB 1300 (National)  Race 1 (7 laps): 1. Arya Singh (DTS Racing) (13:19.668); 2. Deepak Ravikumar (Wallace Sports) (13:24.332); 3. Yash Aradhya (Momentum Motorsport) (13:25.309). Rookie Cup: 1.Arya Singh; 2. 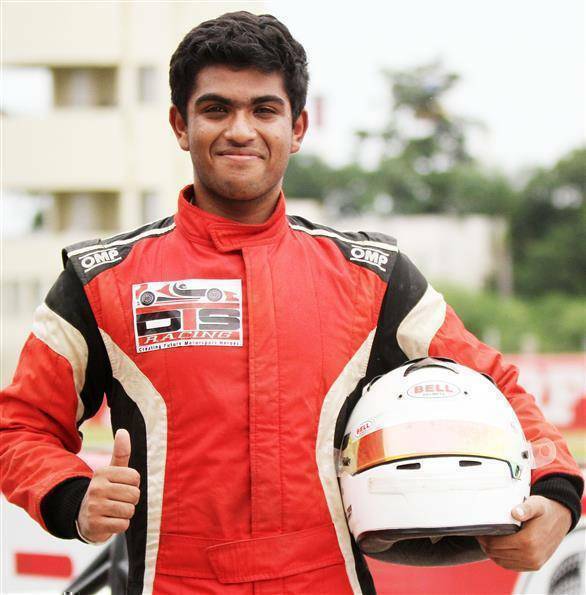 Yash Aradhya (Momentum Motorsports); 3. Nabil Hussain (DTS Racing) (13:29.076). Race 2 (National, 8 laps): 1. Yash Aradhya (Momentum Motorsport) (14:57.852); 2. Arya Singh (DTS Racing) (15:06.503); 3. Rupesh Sivakumar (DTS Racing) (15:08.230). Rookie Cup: 1. Yash Aradhya; 2. Arya Singh; 3. Aanjan Patodia (Momentum Motorsport) (15:19.441). Indian Junior Touring Cars  Race 1 (8 laps): 1. Kamlesh Parmar (Team N1) (17:11.214); 2. Mikhail Merchant (Team Game Over) (17:14.275); 3. Hisham EKP (DTS Racing) (17:23.706). Super Stock  Race 1 (8 laps): 1. RP Rajarajan (Performance Racing) (16:24.531); 2. Varun V Anekar (Race Concepts) (16:25.977); 3. Deepak Ravikumar (Quickshift Racing) (16:51.969). Esteem Cup (Race 2) (8 laps): 1. Narendran Sankaran (Rad Racing) (16:06.645); 2. Anant Pithawalla (Team N1) (16:07.509); 3. Vinod S (Team N1) (16:28.953). Volkswagen Ameo Cup  Race 1 (8 laps): 1. Saurav Bandyopadhyay (Mumbai) (18:07.383); 2.Anning Sun (Shanghai) (18:08.130); 3. A Sandeep Kumar (Chennai) (18:11.152).